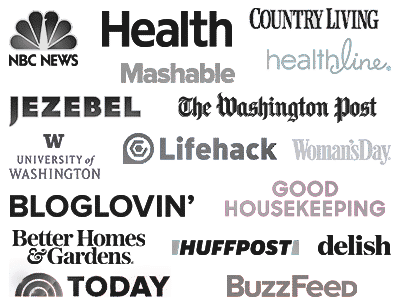 Crockpot Cabbage Rolls – try my traditional cabbage rolls with ground pork, rolled in sour cabbage leaves and slowly cooked in a crockpot. So simple and a definitely a favorite! Boy, do I have a treat for you guys today! Many times I feel bad that I don’t show you more traditional Romanian recipes, but the truth of the matter is that I pretty much gave you all the Romanian recipes I already know, and you’ll find them in my earlier posts here. 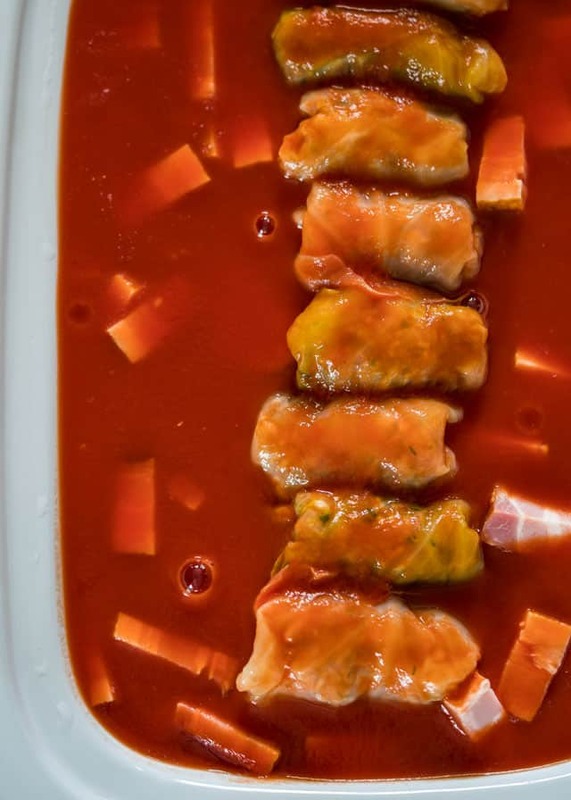 Romanian cuisine is really about meat and potatoes, but if there’s one thing that we’re known for, that would be our cabbage rolls. 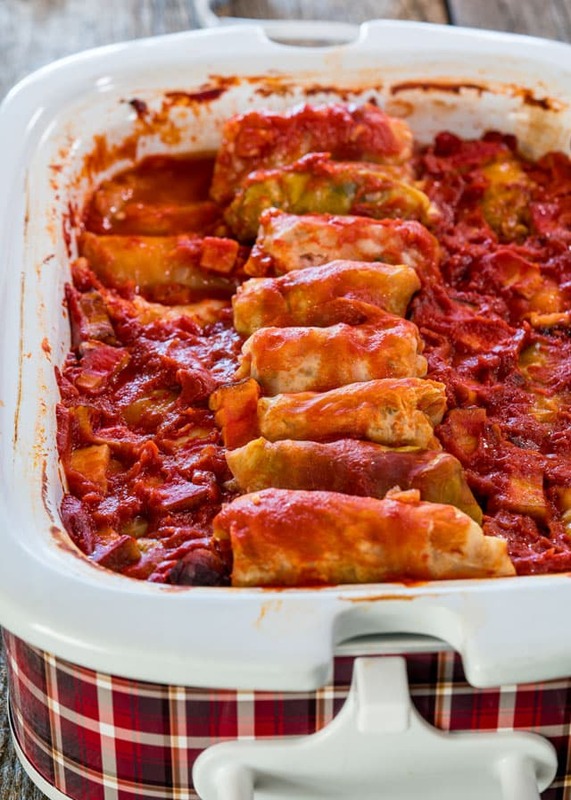 Cabbage rolls are something I usually make for the holidays, because that’s what my mom always does so I associate cabbage rolls with Christmas or Easter. However, sometimes I do miss cabbage rolls and I’ll make them throughout the year. 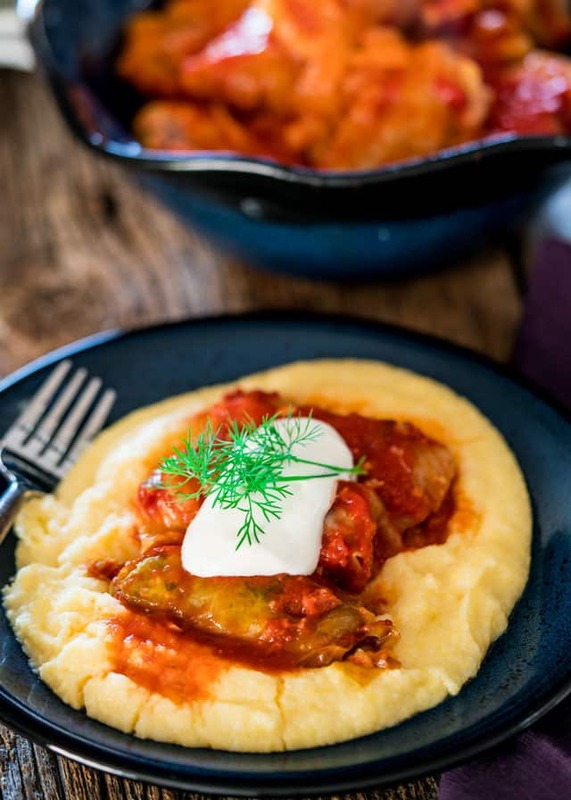 The most common question you guys have always asked me has been if you can make these cabbage rolls in a crockpot. The answer, my friends, is absolutely yes! In fact the crockpot is perfect for cabbage rolls. 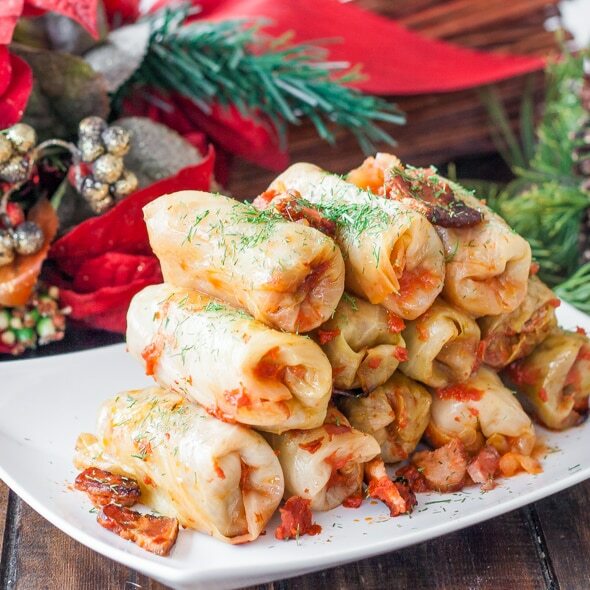 If you check out my other cabbage roll recipe, you’ll notice that I bake mine for a few hours, so doing this during the holiday season can be a pain, since you need your oven for other things. This is why the crockpot is so perfect for cabbage rolls. 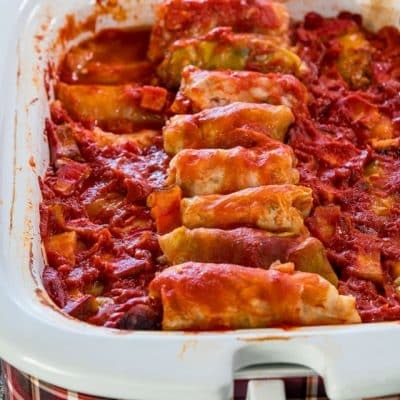 What I usually do is prepare them the night before, and turn the slow cooker on in the morning, and by dinner time your house will smell incredible and you’ll have some nice and delicious cabbage rolls. 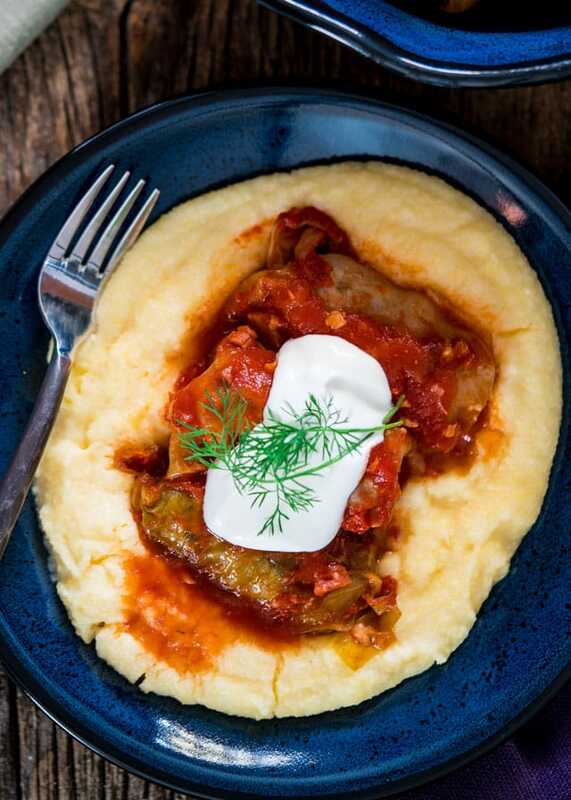 But what makes Romanian cabbage rolls different, you ask. The main difference is that we pretty much always use sour cabbage which obviously flavors the rolls and makes them a bit saltier, which is why I don’t use a lot of salt in the meat mixture. I also like using sour cabbage because the leaves are already soft and it makes it easy to make the rolls, because if you use regular cabbage you have to blanch the cabbage yourself, see the notes section in the recipe for instructions on how to do this. It’s really up to you though if you use sour cabbage or not, I personally prefer the sour cabbage because I find them a lot tastier. Another thing we also do, and really I do this because that’s what my mom has always done, is add some smoked meat in the pot with the cabbage rolls, and you’ll want it to be smoked for that smoky flavor. I usually use either smoked bacon or smoked ham, whatever I find at the store. This is totally optional of course, but to tell you the truth, it’s probably one of our favorite things we love about these cabbage rolls. It makes me really happy to share this recipe with you because this is the kind of food I grew up on and this truly represents the way I like to cook. I sincerely hope you enjoy this recipe and give it a try, and if you do, I’d love to hear from you! Crockpot Cabbage Rolls - try my traditional cabbage rolls with ground pork, rolled in sour cabbage leaves and slowly cooked in a crockpot. So simple and a definitely a favorite! Add the sour cabbage leaves to a large bowl and fill the bowl with cold water. Let the leaves soak in the water for few minutes. This will wash out some of the saltiness from the leaves. Drain the water. If some of the leaves are too big, cut them in half, if making smaller cabbage rolls. In a large bowl mix together the ground pork, rice, chopped onion, dill, parsley, salt and pepper. Use your hands to incorporate everything well together. Be careful with the salt, not too much is needed because the sour cabbage is already salty. Fill each leaf with about a couple tbsp of the meat mixture and roll. Repeat with all the remaining meat and cabbage. If you have any cabbage left over, chop it up and spread it over the bottom of the crockpot. Arrange all the cabbage rolls in the crockpot. If adding smoked meat, add it now over the cabbage rolls. Pour all the tomato juice over the cabbage rolls. Cover the crockpot. Cook on low for 8 hours or high for 4 hours. Serve with polenta or mashed potatoes and a dollop of sour cream on top. * I usually find sour cabbage leaves at my local grocery store like Sobey's or Safeway, but you can also find them at European markets. You can use fresh cabbage instead of sour cabbage, but more work is required. You first have to blanch the cabbage. To do so, core the cabbage first, one large cabbage should be enough for this recipe. In a large pot of boiling slated water, add the cabbage and blanch it for 5 to 8 minutes or until leaves are softened. Remove from the pot and chill under cold water. Another alternative to softening the cabbage leaves is to wrap it in plastic wrap and freeze it for a couple days. Remove the cabbage from the freezer and thaw it out at room temperature. Once the cabbage has thawed out, the leaves should be softened. You can find a recipe for my creamy polenta here. Hi Jo! My family also makes cabbage rolls, so I was interested in your recipe. We use fresh cabbage, but spread a can of sauerkraut in the bottom of the crockpot. It adds tremendous flavor! I can’t imagine making cabbage rolls without. I would guess you wrapping yours in the sour cabbage and my putting sauerkraut in the bottom yields a pretty similar flavor. I thought maybe your readers might want to try the sauerkraut if they are not able to find the sour cabbage leaves. Can’t wait to try so many of your recipes! Made these up for the crock pot this morning – cooking on high, so should be ready about 1pm. Unfortunately there are no Polish grocers in my area, so had to use regular cabbage. If hubby likes these, I will likely check for sour cabbage on my next trip to Crewe, which has a larger Polish community and at least one grocer. I also had to play with a mix of tomato puree and pasata to make ‘tomato sauce’ – which isn’t readily available in the UK. The double concentrated puree is pretty much equivalent to tomato paste, so the mix looked close enough to the sauce that I always used in the US. Looking forward to lunch now! Based on ingredients, I would give this a 5-star rating. Since I haven’t tasted it yet, I haven’t rated. Hi Connie! If you’re in the UK I’m surprised you can’t easily find sour cabbage in stores, it’s such an eastern European thing. Anyway we make it with regular cabbage all the time and it’s just as great. Hope you had a good lunch! You’ll also have lots of leftovers. Lunch was good, and even though I made 1/2 of the recipe as there are only 2 of us, I do have some leftovers which I look forward to eating tomorrow. ((Yum)) My butcher ground the pork for me yesterday, so nice and fresh, and excellent quality. Our community is unfortunately devoid of anything aside from the usual national/regional grocery chains. There’s a small Polish shop in Macclesfield (8 miles north) where I’ve bought stuff, but they do have a limited stock, so not sure if I can get the sour cabbage there. I’ve never been to the shop in Crewe, from the outside it looks pretty big. I will definitely pop in there when I get my act together and make a shopping list. I love sauerkraut, so I suspect the sour cabbage will be right up my street! If I use regular cabbage so I can make large cabbage roll (Polish), do I still use raw pork & rice and stack them in the Crock for 8 hrs.? Yes, you always use raw pork and rice. This recipe looks great but where did you get your plaid casserole crock pot? This food is cooked in my country GREECE and is very delicious!!!! I can’t wait to cook these. Thanks for the information about Sour Cabbage on Amazon. I’ve ordered 2 jars because I didn’t know how many leaves were in each jar. I read the comment that there were about 20 leaves in a jar. The recipe says it serves 28. Does it make 28 cabbage rolls? They look small to me. So, if the recipe makes 28 small rolls, the number of servings would be less than 28. Correct? Yes, the recipe makes about 28 cabbage rolls, but again it depends on how small or big you make them. We usually prefer ours on the smaller size, but if you have a Polish cabbage roll, for example, they are a lot bigger. I said 28 servings, only because I wanted to give you the nutritional information for 1 cabbage roll, but obviously we serve more than, usually 4 or more, depending on your appetite. I hope you give these a try, and do let me know how you like them. Jo, tried your stuffed cabbage recipe, and it was a huge hit. Can’t say I’m surprised. Since my crockpot was at my daughter-in laws house, I decided to dig out my square electric skillet from the archives to prepare this dish. It worked beautifully. I also used a combination of ground pork, veal, and beef in the recipe. The mashed potatoes rounded out a delicious and easy to prepare, home-cooked meal. Thanks Cecile. Ive mixed the meat before for cabbage rolls and it gives it a different flavour. Thanks for your comments! It would have been extremely helpful if you told your readers WHERE they could find sour cabbage!!! 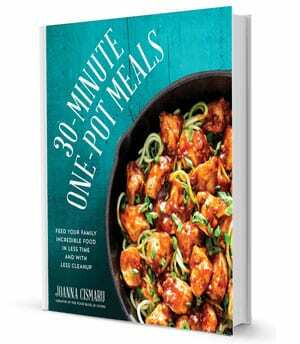 Yes, there is a link below the recipe where you can purchase it on amazon. Thanks for the great recipe, Jo! I spent a lot of time in and around Cluj in the mid-2000’s and never found a good recipe to make my own sarmale. Hope you try this one, Phil! I’m from Cluj, by the way, beautiful place! Sour cabbage is basically pickled whole cabbage in salted water. Yeah sour cabbage is basically the same as sauerkraut, except sauerkraut is shredded cabbage whereas sour cabbage it’s a whole cabbage. How on earth do you ferment a whole cabbage? Interesting, do they sell it at a chain grocery store or specialty store? Where are you located to find this unusual item? I live in northwest Florida and have never heard of them. Below the recipe there is a link for you to get it from Amazon if you would like.